SPOILER ALERT: This review contains spoilers. As a lifelong fan of the horror genre, Jordan Peele’s latest film Us offered me many things to love. 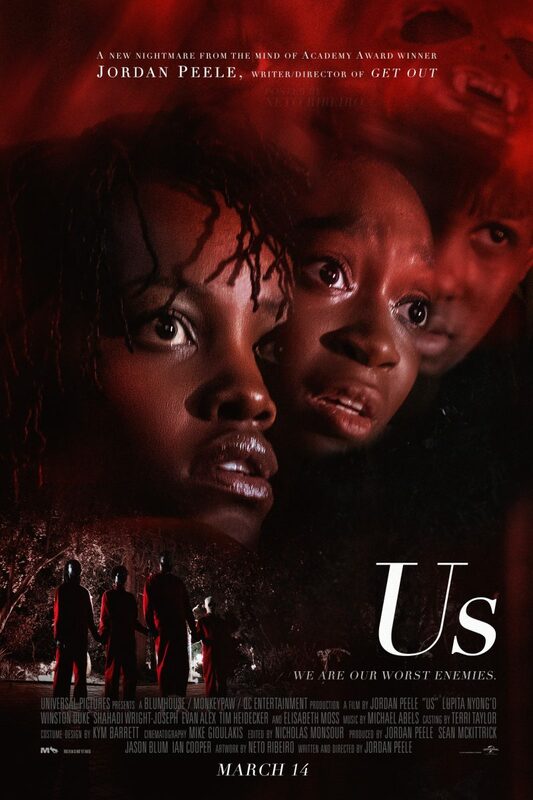 The performances were phenomenal all around, from Lupita Nyong’o’s dual roles that ranged from horrifying, to sympathetic, to downright eerie, and Evan Alex’s nuanced performance that was more astounding considering the actor’s young age, the film once again proved horror films are not just grounds for scenery chewing dramatics. The references to a multitude of horror films and pop culture events from the ‘80s included a treasure trove of “Easter Eggs.” Perhaps none had me giddier than the references to The Lost Boys, considering that as a child it was my go-to video store rental on nights when I couldn’t find anything else to pick (or when I got the disappointing news that the copy of Creepshow I wanted to rent was only available on Betamax). As many fans and critics pointed out, Peele’s film of duality offers at least two interpretations. There is the surface level reading of pure horror, as a group of underground, soulless clones murder their aboveground counterparts, and there is subtext dealing with gentrification, the disenfranchised, and charity as a form of posturing. While neither of those halves was lost on me, as the film progressed I felt another interpretation resonated with me, that of the uncanny as a metaphor for anxiety. Without getting too personal or too Freudian, I should preface my thoughts with a bit of information on both. First, I unashamedly admit I have struggled with anxiety for years. In that time I have attempted a number of methods to keep the anxiety at bay, including medication, meditation, and counseling. As for Freud, I studied the uncanny in graduate school, and to be as simplistic in its presentation as possible, it connects to this idea of the familiar, yet unfamiliar, especially when we see someone or something that gives us this feeling. The uncanny is no stranger to horror films: think the Grady girls in The Shining, or the concept of the living doll in films like Child’s Play. Us easily lends itself to a Freudian interpretation, with the theme of duality including doppelgangers and reflections, each representing these copies that don’t quite feel right. For me, the idea of the uncanny, and the journey of the tethered and untethered characters in this film greatly tie into living with anxiety. Lupita Nyong’o’s complex protagonist/antagonist roles carried many references to anxiety. The film begins with Adelaide’s childhood trip to the Santa Cruz Boardwalk, one that should have been filled with laughter and fun, but was instead rife with anxiety and terror. Her parent’s spend the evening arguing, which likely acted as at least one catalyst for Adelaide’s decision to wander from her assigned spot and take a journey into the hall of mirrors. It is here that Adelaide first meets her underground counterpart, though it is not until later that the audience discovers this is the moment that the tethered and untethered children switch places. Adelaide’s brief disappearance only furthers her parent’s arguing, and until the reveal comes, audiences are to assume Adelaide’s strange behavior is a result of her horrific experience. I viewed the Adelaide/Red switch as the beginning of anxiety. While in the movie the girl’s new demeanor is because the untethered version is trying to assimilate to the behaviors of a typical tethered, her behavior reflects common signs of anxiety. She becomes withdrawn, is not speaking, not doing the typical things she once enjoyed. Her parents see a girl with the outward appearance of Adelaide, but that’s where the similarities end. Even removed from a metaphor for anxiety, Adelaide represents the changes that take us from innocent children to beings on the cusp of puberty, and all the changes we go through during that phase, both externally and internally. In her adult life, Adelaide presents traits common with someone who went through trauma or has anxiety (her mother, in the ‘80s, even suggested Adelaide had PTSD). Often, she is caught up in memories of her past, which sometimes keep her from fully enjoying the present. When her son Jason briefly disappears at the same beach she switched places with the real Adelaide decades before, her panic is palpable. As a mother who has suffered the loss of an infant, I immediately connected with the fear that consumed her. With my youngest child, I am far more anxious about everything from their safety sleeping, to their attempts at learning to chew food, to their car seat safety. With my first child, I was easygoing. I still had concerns about those basic infant safety issues, but I was relaxed about most everything else. It wasn’t until I experienced the loss of a child that I became anxious about even the most innocuous things. Adelaide’s reaction (at least until we are told the truth), can be explained by her connection to getting lost as a child. Her life’s anxiety seems to be coming full circle. Red and her tethered family’s invasion of Adelaide’s home represents the times when anxiety once again takes over. Adelaide is seeing her uncanny self, and she faces new fears, as her anxiety no longer affects only herself, but her entire family. Each untethered is sent to attack its tethered counterpart, with Red staying to taunt Adelaide, most significantly by pushing her face into a glass tabletop, which creates a third “copy” of the woman, as Adelaide’s reflection forms in the glass. As her face is pushed deeper into the table, the glass fractures, creating a cracked surface, much like how the push of anxiety can cause us to feel like we are fractured or makes us more aware of the many pieces of ourselves. The attack of her family represents the feelings and fears that a person with anxiety can have when they try to maintain close relationships. Whether the anxiety manifests as cancelling plans, or staying in bed, or trying to control everything, the effects of the behaviors can fracture or end relationships. In the film’s climax, Adelaide and Red face off after Red is the last remaining untethered and has kidnapped Jason. Adelaide walks to the underground world Red grew up in, and the audience learns the truth (at least most of it). A group of scientists created the untethered as they experimented with cloning. The problem was that only the body cloned, leaving the cloned group soulless. The cloned were the tethered, performing rudimentary functions that their untethered counterparts performed “normally” aboveground. For instance, the untethered enjoyed a carousel ride at the Santa Cruz Boardwalk while the tethered walked around in circles in a room below. Then, after Adelaide kills Red, save Jason, and drives away with her family, the true story is told through another flashback, and that is when audiences finally learn that the heroine they rooted for was actually the tethered, and Red was the little girl we first saw get lost at the film’s start. The climax and reveal both offer representations of living with anxiety. The final scenes of the film deeply resonated with me. On my “good” days, I still often go through the motions, acting the way I know I should, yet often being on autopilot. At times when my anxiety takes over I am not what people see. My anxiety is in control. At first, I was a little upset at the twist because I found it so predictable (but that could be another article, as I remember figuring out the twist at the very beginning of M. Night Shyamalan’s The Village, as the camera panned to a tombstone with the year and I thought to myself “I bet that’s not the year,” but I mainly was looking for a twist because of Shyamalan’s other work). After thinking more about the uncanny and anxiety, the twist felt right. The other characters see Adelaide as a wife, a mother, a friend, but the true Adelaide has spent decades underground, forced to know that the copy is in control of the life that should be hers. It is the perfect metaphor for anxiety, at least how I experience anxiety, and it makes the twist hit home in a painful, moving way. Like Get Out, Us offers multiple readings, and can resonate with a variety of audiences. It is a film begging for multiple viewings, as each watch can uncover more pieces of the intricate web Peele creates. He expertly created a film that paired the idea of the uncanny with the struggles of living with anxiety, and I look forward to seeing more symbolism in the film during future watches.